Bold, vibrant, colourful, unique and playful; these words struck me the moment I entered the Static and Loss exhibition by OCAD alumni, Martin Kuchar and Andrew MacDonald. Unlike many two person shows, Kuchar and MacDonald’s work flow together creating an immersive installation, blending the two artists’ work into one fluid concept. Kuchar presents a series of collaged paper works and MacDonald a series of knitted sculptures. 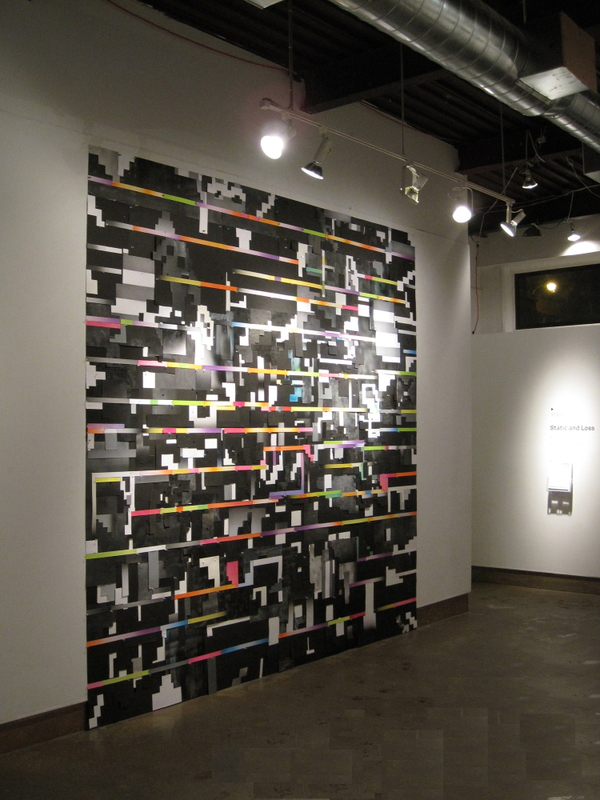 On the walls of the gallery are Martin Kuchar’s large paper based works resembling pixels. These pixel-like structures exhibit an obsession with the miniscule, which is then blown up to a monumental, but surprisingly intimate, scale. The collaged paper is spray painted and laboriously cut into angular shapes. On closer examination one can see that these works are comprised of hundreds of individual pieces painstakingly pinned and taped to the wall and assembled on location. Kuchar’s collage is constantly in motion, as each time it is assembled it will change, allowing for it to have endless variation. Kuchar’s interlocking Borgesian labyrinth at times resembles an intimate conversation with, in the case of Add Inches (2009), Tetris or, in Meltdown (2009), Space Invaders. Kuchar’s work exudes seriousness and commitment, but insinuates playfulness and the verisimilitude of chaos. 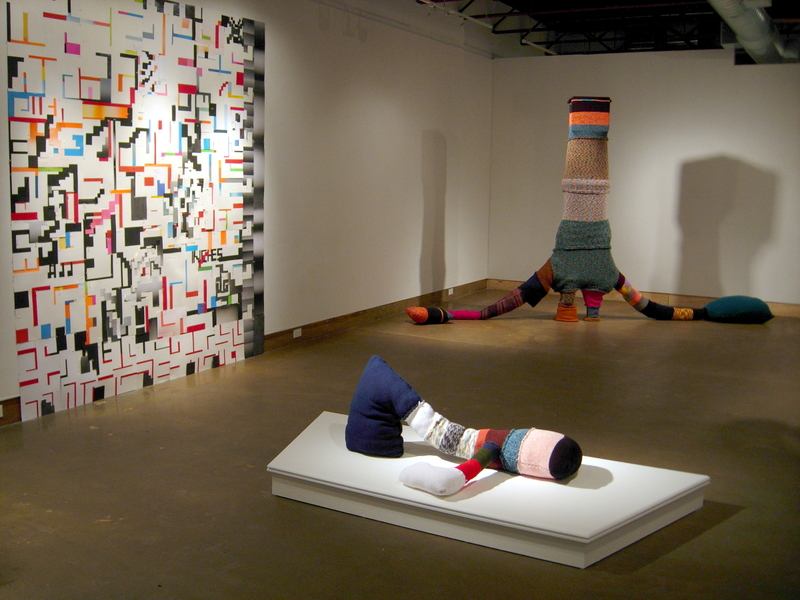 Andrew MacDonald’s sculptures are made from plastic household objects, a combination of found sweaters and manually-operated machine knit textiles created by the artist. 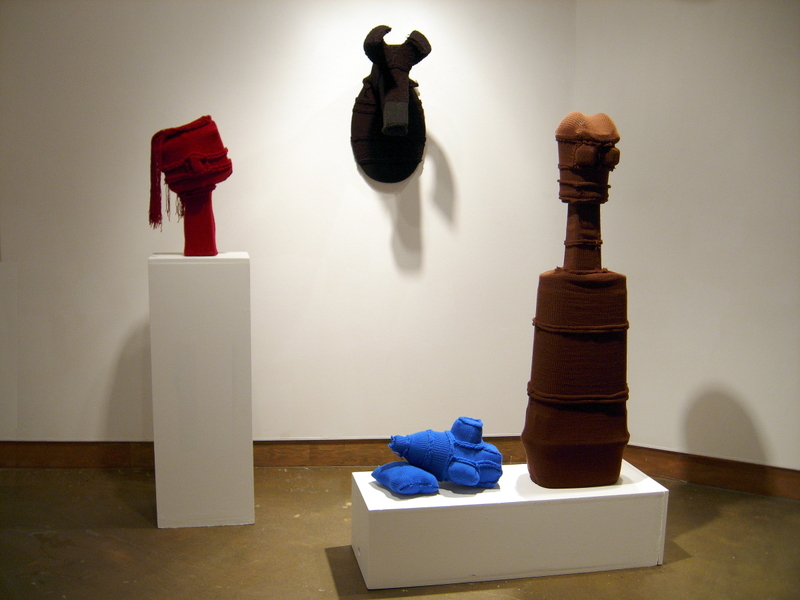 The sculptures are a contrast of hard plastic forms and pillowing organic forms covered in knitted textile. Each sculpture has its own quirky personality, and each is connected through being both a tragedy and a comedy. For example, Heavy Hands (2008) resembles a stitched together monster that is bound by its exceptionally large hands, thin arms and tiny legs. I cannot help but laugh at Heavy Hands‘ out of proportion misfortune, but feel sadness for its crippling affliction. It is the hardness of modern sculpture, contrasted to the warmth of brightly coloured knitted skins, that create the juxtaposition of comedy and tragedy. MacDonald also presents a series of monochromatic works, including a wall hung abstracted knitted animal head, that I could not help but imagine how fantastic it would look in my home. The combination of the two artists’ work is complimentary and visually dynamic. Kuchar’s large paper works create a static pixelated context for MacDonald’s sculptures. Static and Loss is a unique, humourous, but complex two person exhibition.